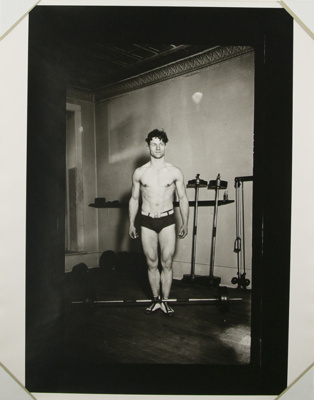 About this objectBody builder standing with hands at sides with a dumbbell at feet. Medium and MaterialsSilver gelatin print from a glass negative. Subject and Association DescriptionArthur Gay was a Rochester-based physical culturist who operated gyms from the 1920s to the 1970s. He made numerous photographs of his students in the 1920s to the 1940s.